Aminopeptidase B is a Zn2+-dependent exopeptidase that selectively removes arginine and/or lysine from the amino terminus of peptide substrates.Arphamenine B is an aminopeptidase B inhibitor first isolated from bacteria. DG051 is potent leukotriene A4 hydrolase inhibitor of leukotriene B4 biosynthesis in the enzyme assay with an IC50=47 nM. 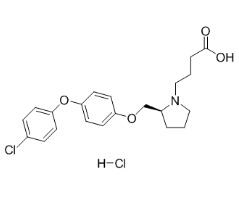 CHR-2797 is an aminopeptidase inhibitor for LAP, PuSA and Aminopeptidase N with IC50 of 100 nM, 150 nM and 220 nM, respectively, and does not effectively inhibit either PILSAP, MetAP-2, LTA4 hydrolase, or MetAP-2. Ubenimex is a competitive aminopeptidase B inhibitor with an IC50 of 100 mg/ml for K562 cells.